Most importantly Hammerworks creates New England Onion Post Light PRG12 completely by hand. All Colonial Onion Lights are made out of your choice of solid copper or brass. Consequently it can withstand harsh weather conditions and will not rust or corrode. In addition to the PRG12 Round Globe style we offer Onion Post Lights in two sizes of classic onion globes. Furthermore we make each of the Colonial Onion Post Lanterns with a 3″ post fitter. As the industry standard it will fit any of our Colonial Style Light Poles. Finally, as part of our Colonial Onion Lights collection the PRG12 coordinates perfectly with Hanging Onion Lantern HRG12 and Colonial Onion Wall Light RG12. We offer reproduction copper Colonial Onion Wall Lights to complement Onion Post Lights. First of all Colonial Onion Wall Lanterns are a practical and functional choice for any setting. You can choose copper Colonial Onion Wall Light OL12 or Onion Brass Wall Lights OL10 with confidence since we handcraft these versatile historic reproduction Wall lanterns from solid copper or brass. In addition we make Onion Wall Lanterns in several sizes so you will always find one just right. Furthermore you can easily place them in both indoor & outdoor settings. 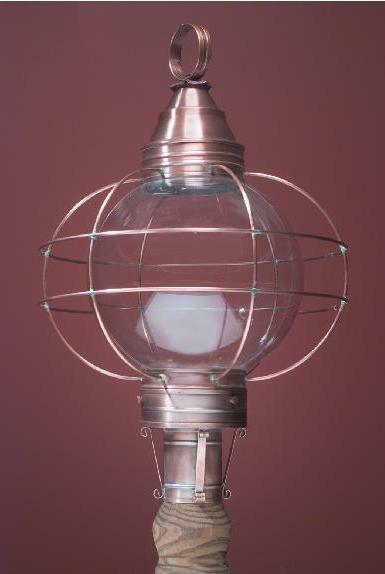 Thus your Copper Onion Wall Lantern is a perfect choice wherever light is needed. 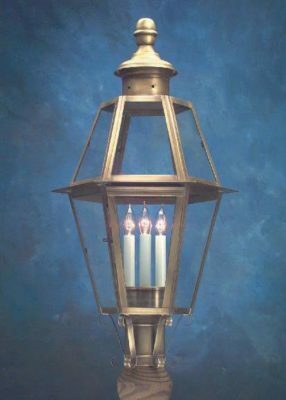 If you prefer to mix and match, we offer a selection of Colonial Wall Lanterns to complement the New England Onion Post Light. Choose from the ever popular Colonial Home Copper Wall Light Pyramid W118 or Reproduction Wall Lanterns Large Auburn W107. Either of these attractive styles coordinate nicely with Onion Lanterns. 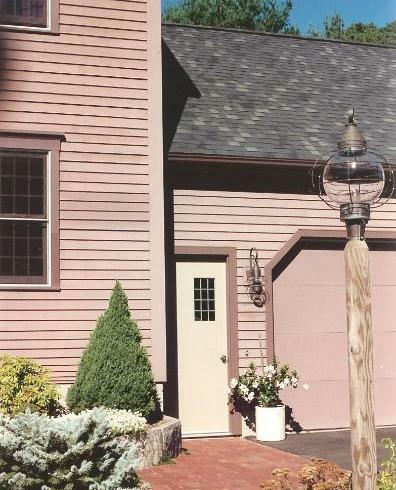 Some other rustic primitive styles such as Early American Wall Lantern Sudbury W111 and Colonial Reproduction Wall Lantern Williams W104 are great choices. No matter what you will find a a variety to choose from within our collection of Colonial Wall Lanterns.